There are some really wonderful dessert wines out there. Have you taken a moment to taste them or do you pass by this unique offering in favor of something you think will be less like “sugar-overload”? While I’m not a huge fan of the uber-sweet, I do enjoy using them for cooking or sipping after a meal. They aren’t something I would typically choose to drink, but I certainly try everything offered when I’m on the tasting side of the bar. Noche Chocolate- Silver 2012 VA Governor’s Cup, Silver Atlantic Seaboard Wine Association. A Virginia Norton dessert wine infused with chocolate, Noche is a decadent treat. Hints of black cherry and raspberry complement rich aromas of cocoa with a chocolate ganache finish. I used this wine for a dessert I made a few months ago and it’s just wonderful. I started by making a Noche Reduction. Using the entire bottle of Noche, I cooked the wine until it had reduced by half, until a spatula left a slight line when drawn across the bottom of the saucepan., stirring frequently. I then added about a thumb (“The Force” at work) of butter and a spoonful of sugar or so. I also added a tiny dash of vanilla, more to satisfy my thoughts that I was actually “cooking” instead of just throwing stuff in a pot. I allowed the sauce to simmer a bit until the sugar and butter had melted and been thoroughly incorporated. Once this was done, I removed the pan from the stove top and waited (impatiently) for the sauce to cool thoroughly. Once cooled, my new sauce was ready for use. I decided to make a Hot Milk Sponge cake, cooked in a Baker’s Secret pan that was made to look like a cross between a trifle and a pie… it’s apparently called a Duncan Hines’ Tiara Dessert pan. The sides are fluted, there’s a high edge and then a lower cake level so you could put “something” on top of the cake and not have it dribble over the edge. 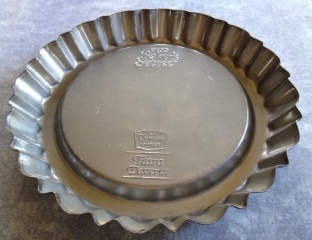 If I remember correctly, they marketed this pan for use with a thick pudding mixture you would pour in the center and then top with whipped cream. 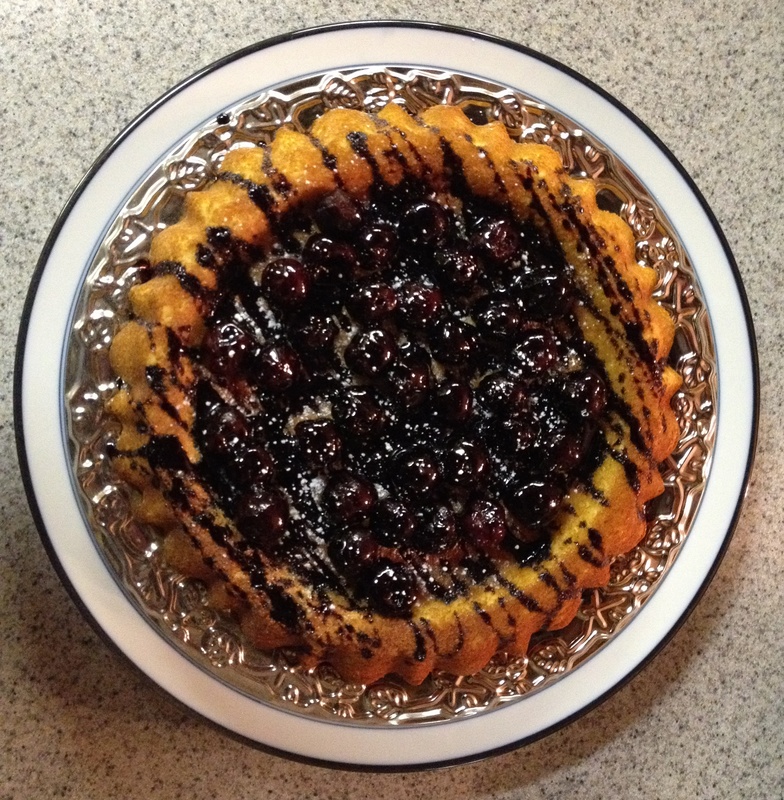 For this specific dessert, I made the Hot Milk Sponge cake (only a half recipe was needed), cooled the cake, then filled the “inside” with frozen whole cherries before drizzling the sauce over top. Dusting it with powdered sugar was all I needed to make the dessert look magical. While it was beautiful, it wasn’t the easiest to cut… the next time I made this dessert, I topped the entire cake with whipped topping before drizzling the sauce, thereby allowing the berries to remain in place and giving some height to the dessert. Either way you decide to make it, this sauce was a knockout. If you’re looking for an easier thing to do with this sauce, just slice pound cake (you can pick it up in the freezer section of your local grocery store), top with fresh fruit, and drizzle with sauce. Simple and delicious! An even easier option would be to drizzle the chocolate wine (sans cooking at all) over ice cream or pound cake or angelfood cake or… you get the idea, right? Using The Force when you create desserts can be a lot of fun. Try to imagine the taste of what you’re creating and then see if you can break that taste down into ingredients. Even using a store-bought chocolate sauce and adding some of Cooper’s Noche to thin it out can take your dessert to a whole new level. Eating wine for dessert instead of drinking it… quite a different concept, yes? Enjoy! This entry was posted in Recipe, Wine and tagged chocolate wine, dessert, easy recipe, sponge cake, using The Force.